Please feel free to comment below or tweet us @can_of_corn! KU/Mizzou Trash Talk is highly encouraged. For weeks now, all of college football has been talking about expansion. Most of the expansion talk has revolved around Texas A&M and their determination to join the SEC. A few days ago, the SEC voted to let Texas A&M join their conference but, only if there is threat for legal action. The problem is many of the teams in the Big 12 are considering legal action, with Baylor leading the charge. The question is, why does Baylor care if Texas A&M joins the SEC when they didn’t say a word when Nebraska went to the Big 10 and Colorado went to the PAC 10, which is now the PAC 12. I believe Baylor is worried about the conference breaking up, if it does break up, they know the chances aren’t good that they would get invited to a major conference. Of the 10 teams currently in the Big 12, Texas A&M is trying to go to the SEC. Oklahoma, Texas, Oklahoma State, and Texas tech are all being mentioned as candidates to join the PAC 12. 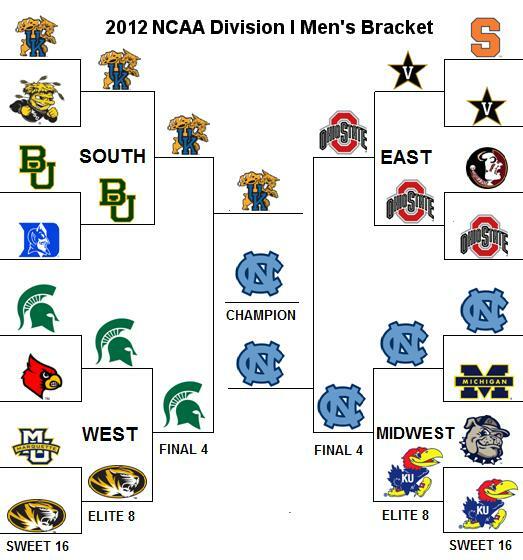 Mizzou, Kansas, and K-State are rumored to be candidates to join the Big East. That leaves Baylor and Iowa State with nowhere to go. Baylor has a student body of roughly 12,000 students. For a comparison Alabama has a little over 27,000 students. Baylor just doesn’t have the size or the money a big conference would be looking for, so who can blame them for trying to stop Texas A&M from leaving? If all of the conference expansion actually occurs, it will change college football as we know it. Rivalries that we have followed for years will cease to exist. They will be replaced with rivalries we have to fly halfway across the state to see. Suppose Texas goes to the PAC 12 and Texas A&M goes to the SEC to watch Texas play USC you have to go clear to California if you’re a Texas fan and to Texas if you’re a USC fan. You can’t just drive an hour and a half and go to College Station from Austin. Aside from that, if the Big 12 breaks up, the bowl system will have to be completely reconfigured. In a few weeks, Oklahoma will decide whether they are going to the PAC 12 or not and we will know the future of the Big 12. Hopefully, Big 12 commissioner Dan Beebe can come out of his cave perform a miracle and keep conference armageddon from happening. I would personally like to thank Carolina Panthers’ wide receiver Jamorris Warren for giving me the opportunity to interview him. On March 11th of this year, there was a collective groan across sports nation as the NFL owners confirmed our worst fear – there was going to be an NFL Lockout. The idea that there might not be a professional football season to look forward to in 2011 was now a possibility. For many players it meant having to organize work outs, and for those whose names aren’t as familiar to us – it meant having to find a second job. For some players it was an opportunity to pursue other sporting interests such as boxing, the MLS, track, and professional bull riding. The players held their breath uncertain of what may happen next. The sports media grew worried and were anxious to generate football-related news. The sector of the American public who find sanctuary on their couches every Sunday afternoon and Monday night for 17 weeks a year felt as if they too had been locked out and were being deprived. 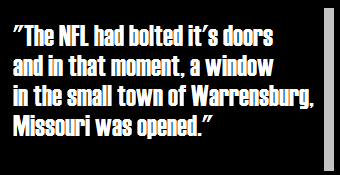 The NFL had bolted it’s doors and in that moment, a window in the small town of Warrensburg, Missouri was opened. Six days after the lockout was announced, Jamorris Warren stepped inside the Devine Indoor Pavillion on the campus of the University of Missouri. 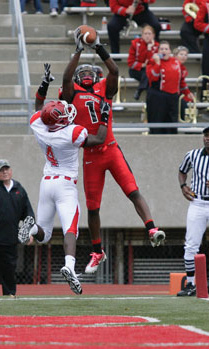 Warren was coming off of a spectacular season for the Division II Central Missouri Mules. In his senior year he had set school records for receiving with 109 receptions for 1,458 yards and 20 touchdowns. This 6′ 195 pound receiver who ran a sub 4.5 40 yard dash was the favorite target of Harlon Hill winner Eric Czerniewski as Warren helped lead the Mules to their first playoff win in school history. On this particular day, more than 125 NFL talent evaluators, scouts, coaches, and executives representing all 32 teams had descended upon Columbia, Missouri but none of them were there for the wide receiver in a red Mules football shirt standing on the edge of the field. Some were there to see the coveted defensive end Aldon Smith and others were there for the highly touted quarterback Blaine Gabbert. Even a quarterback prospect with as much draft stock as Gabbert had, is useless without somebody to throw the ball to. That’s where Warren came in. Due to restrictions imposed by the NFL Lockout, Missouri quarterback Blaine Gabbert (above) was forced to do his workout with Division II receivers as opposed to NFL players. Due to the NFL lockout, Gabbert would not be able to do his Pro Day workout with current NFL Players (such as Eagles wide receiver Jeremy Maclin or Rams wideout Danario Alexander, both Mizzou alumni) as is traditional. Since Missouri had no draft eligible receivers, that option was not available to him either. Gabbert’s camp was charged with finding wide receivers he could work with. The result was a Division II all-star receiving corps from colleges around the state that included, among others, Jamorris Warren and his teammate, running back Anthony Stewart. 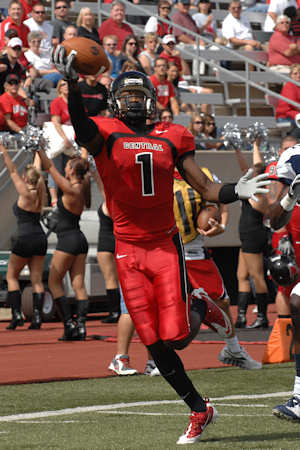 As a senior Warren set UCM records with nearly 1,500 yards receiving, 109 receptions, and 20 touchdowns. Everyone may have been there to watch Gabbert throw but Warren knew that the NFL lockout had given him the chance to show the NFL how well he could catch. ” [Blaine Gabbert’s Pro Day] … was a great opportunity for me to showcase my abilities in front of all 32 teams and several GM’s.” Jamorris took full advantage of that opportunity. Gabbert had an impressive workout for the scouts but some overthrown passes that Warren was able to reel in caught the attention of the scouts on hand. He snagged up every pass thrown his way. A series of acrobatic grabs turned the heads of those in attendance. One particular catch, a one handed grab near the sideline, even garnered some applause from those at the Pavillion. While the media talked about Gabbert and Smith and speculated about where they may land in the draft, Warren took his newly found draft stock and got to work feeling like he was one step closer to his dream of playing in the NFL. When the NFL draft rolled around in late April, Warren took it as an opportunity to spend some time with loved ones. He watched the first night and saw Aldon Smith go 6th overall to the 49ers and his friend Blaine go 10th overall to Jacksonville. He watched the second and third day with his family that weekend. Warren was excited as the third day of the draft came believing that he could go in the 6th or 7th round. He saw Abilene Christian’s wide receiver Edmund Gates, who his Mules had beat in the second round of the playoffs, go in the 4th round to Miami. And then in the 7th round, the Vikings selected wide receiver Stephen Burton from West Texas A&M (who had lost to UCM in the first round of the NCAA-II playoffs) and Warren was still on the board. The Houston Texans announced the final pick of the NFL Draft and Warren was still without a team. “Not getting drafted didn’t bother me,” Warren said, “because that’s been the story of my life – proving everybody wrong.” When asked if he felt that being from a Division II school had put him at a disadvantage Warren replied, “Teams will find you no matter the level of play. I can say it [coming from a small school] made me hungrier and more determined to be successful.” He was complimentary of the experience he had at Central Missouri and mentioned that the coaching staff there had played a large role in his success. Traditionally, NFL teams would have reached out to players like Warren who went undrafted to offer them rookie free agent contracts after the draft had concluded. Unfortunately, the same lockout that had created the chance for Warren to get noticed had now created uncertainty for him as to whether or not he would find a team. After finishing his senior year at UCM, Warren returned to his hometown of Belle Glade, FL and spent the summer working out at Glade Central High School, which he had once attended, and the Test Football Academy in Boca Raton. He knew that the lockout had to end and when the call came he wanted to be ready for play in a faster game. He worked hard all summer with the confidence that when play resumed, some team would give him the chance to make every other team regret ever passing on him. On July 21, the NFL officially lifted the lockout and returned to work as usual. Shortly thereafter, teams started calling Warren and less than a week after, he signed on with the Carolina Panthers. There are still many questions as to whether or not Warren can make it in the NFL but he has already drawn comparisons to another MIAA conference wide receiver who went undrafted – Missouri Southern’s Rod Smith who went on to become an integral part of a Denver Broncos team that won two Super Bowls. For now, the long wait to find an NFL team is over for Warren. Many are going to talk about the disadvantages of the NFL Lockout and how the rookie class was affected by the shortened offseason training activities (OTAs). For Warren though, the NFL lockout created a unique opportunity for him to showcase his talents before the entire NFL. If not for the labor dispute, he may not be fighting for an NFL roster spot in Spartanburg, South Carolina this week so for him shortened OTAs are better than none at all. While Warren received calls from the world champion Green Bay Packers and the St. Louis Rams, he is excited to be apart of a Carolina team that some believe, after a strong draft class and re-signing all of their major free agents, could come out and surprise people this year. 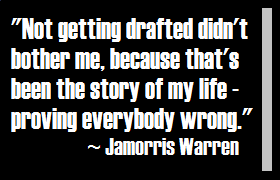 And maybe that’s why the Panthers make sense for Jamorris Warren – he has been surprising people his entire life.